Image taken in Phoenix, Maricopa Co., Arizona. June 27, 2006. There is a full resolution photo is hosted at Wikimedia at Halictidae. 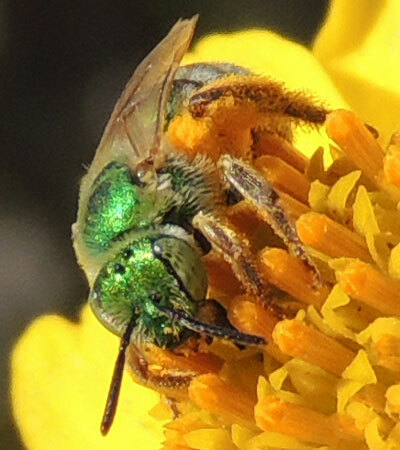 The colorful bee at left is the male Metallic Green Bee and lacks a stinger. The males do not gather pollen nor do they help in the construction of the nests. 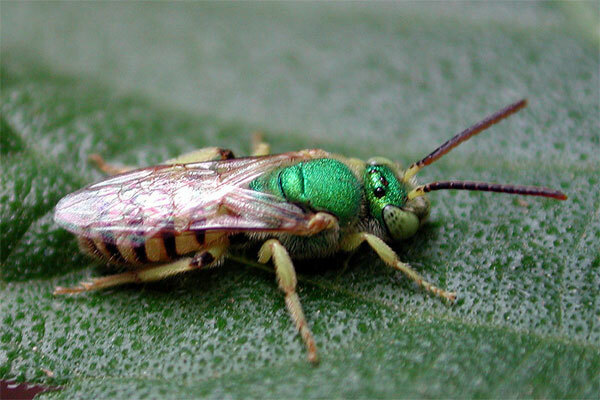 Agapostemon texanus is found across much of the United States. Below is a female bee gathering pollen from flowers of Brittlebush (Encelia farinosa). The golden-orange pollen is gathered into a basket formed from stiff bristles on the third pair of legs. It was observed in Glendale, Arizona, USA on 14 April 2013. Some species of Halictidae are attracted to sweaty bodies and will take the sweat for its salt content. Agostemon bees rarely do this. This species is common in Phoenix, Arizona, where it visits the flowers of various shrubs such as lantana.